How would you feel if I said you could have a no waiting list precision rifle that's served humble pie to some very very nice custom builds? For 30% of the cost of an Accuracy International? Yeah me too. Choice of three. Or five depending on who you listen to. What a time to be alive. Some of the younger members of my club [which means people under 60] have been saying good things, very good things, about the Ruger Precision. Not for the first time Ruger set the pace for the industry, to give them their due the RPR has done just that. 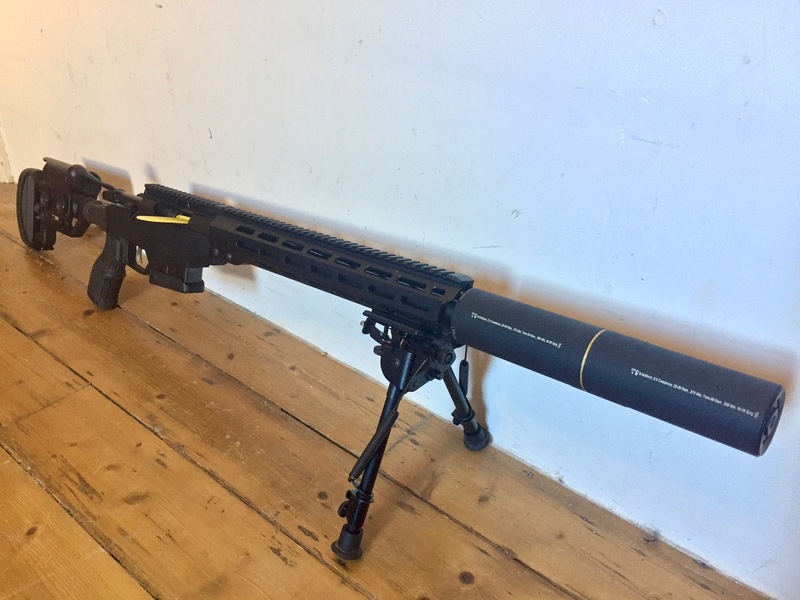 Catching both the Precision Rifle and AR trends; a rifle you can customise at home with thousands of readily available options, it takes AR grips and stocks. That's also ready to compete in precision matches right out of the box. Now on Gen.3 there's a growing choice of factory calibers and aftermarket barrels, parts and it takes Pmags. Down on the south coast at OMR's club there's a whole cadre of owners. At both clubs .308 Nato and 6.5mm Creedmoor are neck and neck in numbers. In Spain Bergara Rifles offer their riff on the idea. They have an excellent reputation for their button rifled barrels, and have wisely chosen to build their rifle on the Remington 700 footprint. If you wanted to develop a rifle from one; you can have your choice of 100's of stocks, triggers etc, and it takes the proven and readily available AI magazines. Money pit, fun money pit, but a money pit I can't allow myself to be sucked into. This time. On every thread I read; where someone was asking where to drop their hard-earned, there was the 'That being said Now try the Tikka' comment. I have never shot a Tikka that wasn't accurate and amazing value for money. Asking about; people who wanted one because their mate has one shed out and bought the Ruger, people who have shot both bought the Tikka. The best review the Bergara got was 'its the equal of the Tikka'. It might be different where you are but here there's less than £100 in it either way. No one I found in the UK is including extra magazines or postal rebate magazines from any of the brands. The Howa guy is yet to return my calls. Not even sure you can even order the Savage here. I was feeling pretty swayed, but you know, cash is king. There just weren't that many second hand Rugers in Creedmoor, even fewer Tikkas in general, and no sign of a Bergara. I was becoming pretty much resigned to saving up to pay full-whack for a new one when I found a 20 inch Tikka in 6,5 CM with a Stalon advertised. The owner had a presence on a couple of forums where he'd posted enough to give me a bit of comfort. He's hanging up his spurs and offered to throw in the contents of his ammo boxes and a goodly pile of Lapua cases. Rude not to. We had a couple of false starts while I traveled in the wrong part of the north, with my ticket back at home I couldn't take delivery. We prepared to do a dealer-to-dealer exchange, then the seller announced his work had scheduled a meeting for him in central london. We agreed to meet in a business traveler hotel just down the road from an office I myself am occasionally compelled to attend. I was envisioning something out of James Bond or Lord of War, with a sniper rifle laid out on the bed. Just in a cheaper hotel. "Sorry it'll be a day later and they've moved me to another hotel". The next day he found he had no hotel, 'but don't worry there are plenty of meeting rooms at the london office'. It's not like this in the movies. The receptionist denied that he worked there or existed. I rang him. He was sitting on the sofa next to her desk. Frosty doesn't cover it. It's as though we'd been married already. My laughing didn't seem to help lift her mood. Now we get to the paperwork, three lots; firearm, silencer/moderator, and ammo are all controlled, and need to be listed. The only available meeting room has a young fella working away at his laptop, we sit at the other end of the boardroom table. The seller walks over to the young fella, shows his office ID, and licence before he says "we're both licensed to possess firearms and I'm selling him a rifle, he needs to confirm its serial number" There's a slight pause, "I'm cool" says the young fella. We complete the transaction; re pack the Tikka back into its cardboard box, say our goodbyes, quick "thank you" to reception, and I'm back in the street. Wondering if the Uber or the armed response team will get there first. Ho, ho, ho! Forgive the long radio silence but I thought you were against the AR platform. Well, the times they are a changing and no wonder, great guns and fun to shoot. Saying that, I have a slew of ARs waiting to be cleaned -- it's an issue. Gas guns get dirty. Filthy little beasts. Nice one. Speaking of which, I've got a good mind to build a Grendel upper. Just for kicks really but still, neat.